Now just bear with me on this . . . In the past few days I’ve given myself a good talking to about bragging too much, and I took wise advice from trusted friends, including suggestions about my propensity to talk about turtles and spiders and such. I think all this helped me quite a bit, more or less. But here’s the thing about spiders. Let’s say that spiders make you shiver with disgust and you want to smash every one you see with your foot. That’s fair, except to the spider of course. I understand. BUT. Let’s say further that you also are a writer. And one day, no matter how much you despise it, you find yourself having to write something that has a spider in it. Now you’re in a fix. The only spiders you’ve ever studied were attached to the bottom of your shoe, and they weren’t really giving you their best face. You think White made up the life of a spider or read descriptions in a book, or did he really look at spiders and observe them going about their stealthy, deadly business of eating flies and, sometimes, one another? Me? I think he knows too much to have Googled it. He tells it too well to have imagined it. I think E. B. White was an observer who wrote about what he saw and came to understand the world around him. 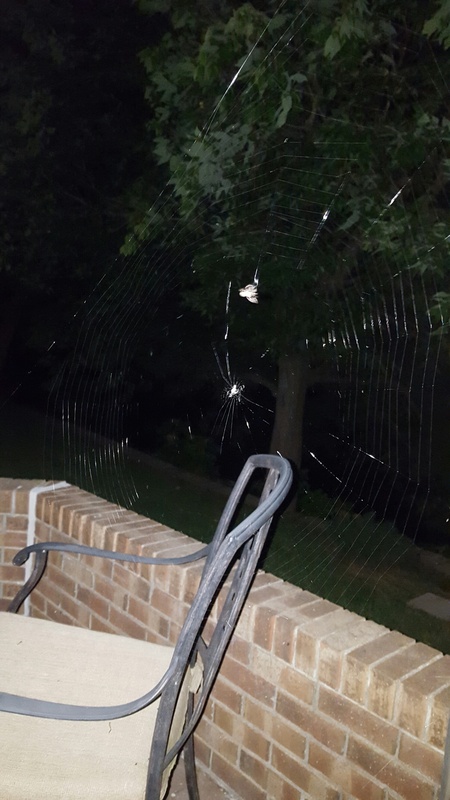 So back to me and my blog and these spiders I keep watching. Last week we had two new ones move in about ten feet apart. One, a filmy dome spider (that’s its name I swear) showed up at the upper corner of the window that separates our dining and living rooms. It hung out for a couple of days checking out the place for a potential corner office. The other, a large funnel web spider, took up residence outside the kitchen window between the glass and the frame. My first clue was a small leaf that blew into an otherwise hard to see web. Before long, a bee hung suspended near the leaf, and this was interesting enough to get the spider up and out of its hideaway. Meanwhile Miss Filmy Dome had hung her own web out for business and was as busy as a, uh, seven-legged spider. She had two gift packages already wrapped and waiting when she had time to stop for a bite. But then fate stepped in. 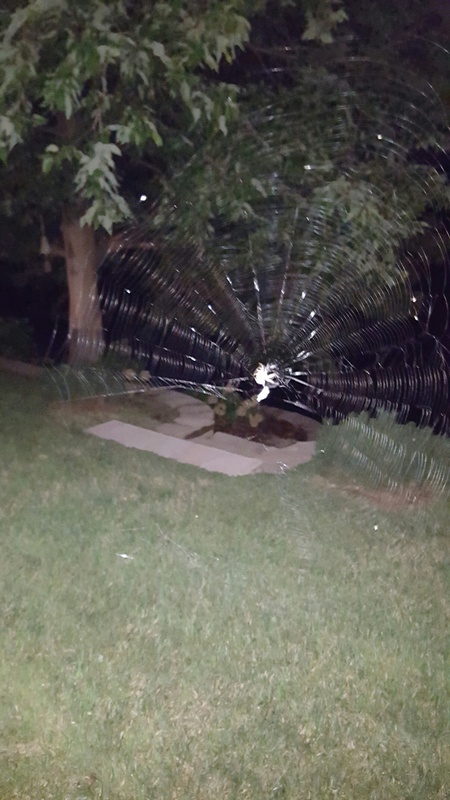 Our big hairy scary funnel webber made a mistake. She set out to pay a neighborly visit and got caught up in the conversation. Next thing she knew, she was dinner. When I stopped taking pictures, Miss Filmy was daintily finishing her meal and, I would think, be preparing for a nice long rest to aid her digestion. Next time you have to write about a spider, find a web or two and settle down for a good watch. No major actors in these dramas, but dramas they are nevertheless. P.S. I just stomped on a spider crawling across my floor. Man I hate those things! Sitting outside late last night beside the water. 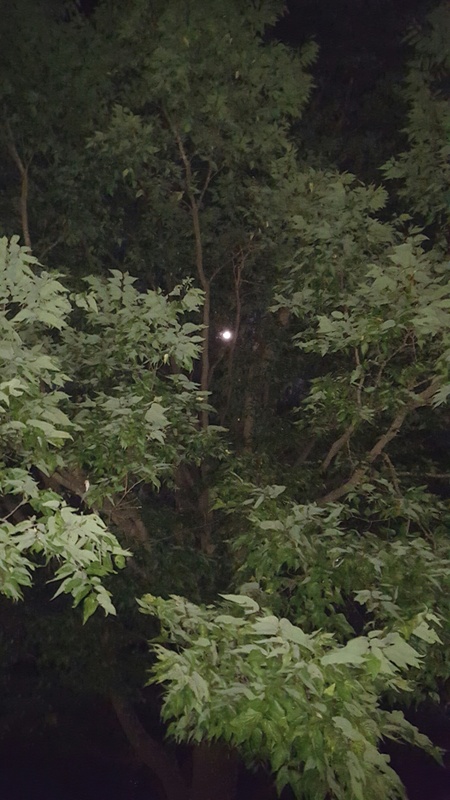 A full moon worked its way through the hackberry overhead. To our left a busy spider trapped a small moth and dashed across its web to claim its trophy. Five feet away a second magnificent web was the stage for the nimble dance of another spider with its midnight snack. I didn’t look around for more webs, but I knew they were there. Warm night, plenty of moths, great for hunting, if you’re a spider.